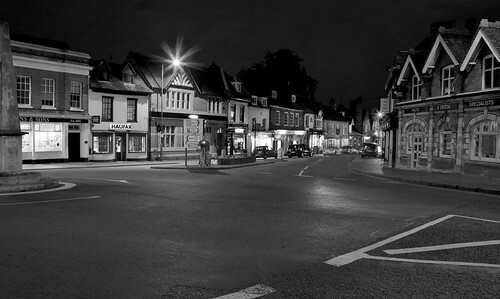 Night photography in a village centre. You will mainly need your normal kit. The standard DSLR is a capable night camera. However, you will need a tripod. Most night shots use long exposures. Some exposures may be up to thirty seconds or more. You cannot hold a camera steady for that time. If you don’t have a tripod consider bean bags, Joby Gorillapod for Canon 450D, 1000D,500D, Nikon D3000, D5000,D90, Sony Alpha DLSR Range, and Panasonic G1 Series – SLR Zoom , walls, the ground, chairs, the car roof… be inventive! Aside from your photographic kit some other equipment is advisable. Two flash-lights (torches) are useful. Put one in your pocket and one in your camera kit. It is easy to lose stuff in the dark (including your light) – a torch helps find things. Wear sensible, appropriate clothing. Often night photography is a Winter pass-time because of short days. Warm clothes, a hat and proper warm shoes help make a night shoot pleasurable. cold, and especially wet, conditions can be miserable and even dangerous. Don’t forget something to eat and drink. Hot soup, or in Summer, a cold drink, can be a lifesaver and make your trip a pleasure. If you are with others sharing a short break with drinks and a nibble are fun and a great time to exchange ideas. Poor preparation can spoil a shoot. We do night shoots because they are fun! So look after yourself, wear the proper protection, enjoy! Location research – scout days ahead of time, do light and dark visits to several alternatives. Pick the site you are going to use, especially for parking and danger spots. Be ahead of the game for the dark-time shoot. Ask local photographers, contact local photography clubs. They know the local sites and will have invaluable knowledge to save you time. Photographers love to share! Shot planning – ensure you have a clear idea of what you are shooting and plan for it. Check out tripod spots, angle of the ground, trip hazards, dangerous gullies and so on. It is not just safety, it helps make sure you get the shot you want. Pack in a way that helps you find things in the dark (bright tags on small things help). Pack logically so you can find just what you need without rooting around. Time research – checkout the time it gets dark (or light). Plan to get there with plenty of time to set up before the optimum shoot conditions. Shooting lights? Know when they go on (or off), know if they change. You don’t get reflections if the lights go off! Many buildings are not lit all night, just early evening. Route planning helps you get there on time. Map-work is often useful for planning your shot directions too. Practice using the appropriate settings before you do it in the dark. Doing settings in the dark is twice as difficult if you have not done it before. Have a list of emergency services contact details (coastguard, mountain rescue, police etc) for your shoot location. A home contact person and telephone connections are essential too. Emergencies get far worse if you are out at night. If you are unconscious in a field and no-one knows where you are or when you should be home you could die. Always tell someone where you are, your plan, when you will be home and how to contact you. Remember to have their contact details to tell them when you are home safe. Don’t plan to go places where you are not trained to go. Mountains, boats, caves, rough country and some urban environments can be very dangerous. Within minutes you can be in trouble. Planning helps you to be aware of the dangers. However, consider getting specialist training before you take on an adventure. A large proportion of wilderness accidents happen at night – without training your survival chances are reduced. Consider going to outdoor locations with other people. “Less than three there should never be!” One injury leaves one support person and one person to go for help. Looking forward to the night you do your shoot is fun. Thinking and planning your shoot gives you endless opportunities to try out things, play with your kit and get ideas from people. If you are prepared your shoot will go better, you will learn a lot and get better shots. Have fun getting ready for your shoot! Out on your night shoot. This entry was posted in Background Info., Starters School, Tips Tutorials & Techniques and tagged Health & Safety, Light, Night, Tripod. Bookmark the permalink.